The day began a bit early as we all rose for breakfast and then congregated at the door of the Magic Bus to begin our field trip to the Alaska Native Heritage Center. Not a very long drive, but enough time to admire the snow-sprinkled mountains and the sun peeking through the clouds to highlight the alpine meadows climbing up the sides of the mountains. Green is an abundant color, though we did notice that the leaves are already starting to turn to fall here in the last frontier. 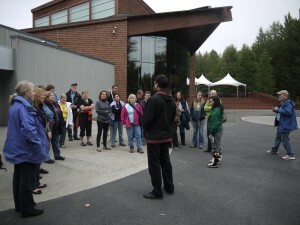 We arrived at the Center to be greeted by our guides and begin our private guided tours through the center. The elders of the natives from the Anchorage area were asked for permission and blessings to build this center which seeks to educate the world about the rich cultural heritage of these tribes. Not much to the main building, we hustled outside to walk through the largest part of the center which features small, replica villages from each of the 5 language groups that the Alaska Natives are grouped into. We were split into two groups, and Casey led us away. Walking the trail through the villages, Casey told us stories, answered questions and shared his vast knowledge of all the cultures. The rhythm & cadence combine with the pitch of his voice provided a fabulous. Casey is from the Cupik tribe and regaled us with stories of how he grew up and even how he still goes home to hunt. We learned history & traditions as well as how the people currently live in the most remote areas of Alaska. We returned to the main building which houses the Hall of Cultures, theatre & gift shop. A craft fair was being held in the Hall of Cultures with vendors selling handmade items. The theatre is a stage to show off cultural traditions including games/sports, singing & dancing. There was a demonstration of boys kicking a ball high in the air and then Haida people came out to showcase songs and dances. Their regalia includes the famous button blankets. The end of our tour came at the end of the singing & dancing, so we all sashayed out to the bus to the beat of the drum. So sad that the bus back to the hotel was not the Magic Bus. Oh well. From the hotel, we all took off for various destinations for lunch with downtown being the most popular. We split as some had stomachs eating through their abdominal walls, so they found a restaurant right away. Others decided to wait a bit and took the one hour Historic Anchorage Trolley tour. The downtown Anchorage Visitors’ Center has a shuttle pick up and drop off. Most of the tourist attractions provide free shuttles to their sites for tourists. Very convenient. After a tasty caribou/reindeer cheeseburger with salad (oh, I’m being good), my group walked around downtown to various cheap & tacky (some not-so-tacky but out of my price range) tourist shops to gather souvenirs. 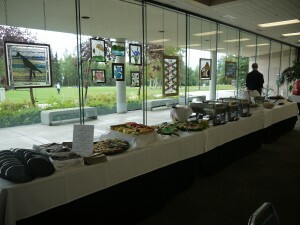 Our adventure took longer than we thought as we arrived back at the hotel with just enough time to change and make our way over to the Welcome Reception at the Carr Gottstein Lobby at the Alaska Pacific University campus. And again, the food was most excellent. Sort of an open bar, but the group must be slowing down as there were still some full bottles when I left at 730. So, there were lots of hugging and excitement as we all greeted those who visit with us sporadically as well as those who we get to see annually. During the dinner, the local hosts had door prizes. Thanx for the chocolate covered espresso beans. I do love them so. I fell into the comfy bed with a sigh and lost myself to dreams of seeing wild moose & bears & other wildlife. Copyright © 2012 IAMSLIC News & Events. Powered by WordPress and A Dream to Host theme by Art of Blog.